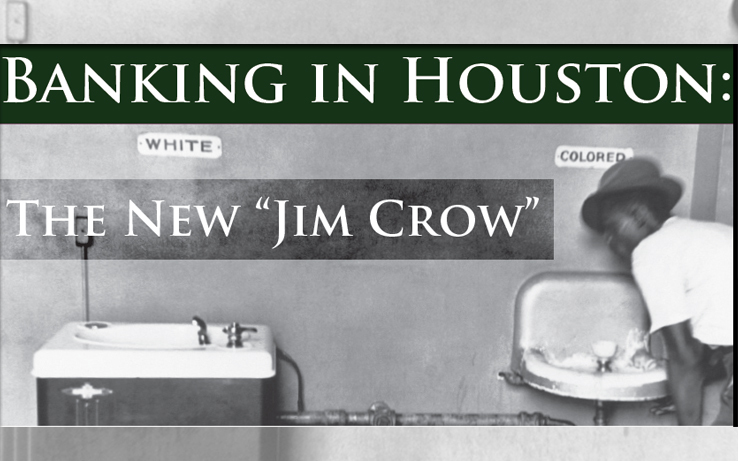 Banking in Houston: The New “Jim Crow” Is there more to come? In August of 2016, prior to the presidential election, the Forward Times said it was coming: a disturbing new culture shift in America that could potentially hurt Black and Brown people in very significant ways, primarily spearheaded by the divisive and racist rhetoric of then-presidential candidate Donald J. Trump. Of course, we hoped we were wrong about this disturbing new culture shift becoming the norm, and we also hoped that here in Houston, we would somehow escape the pain. Unfortunately, it seems that Houston might be feeling the impact of the Trump Administration in more ways than one; possibly more than any other cities in the state of Texas. Now, over a year since Trump was elected, there appears to be a heightened attack on African American mid-level and high-level executives in major companies, and based on a lawsuit that was recently filed, one company that operates here in Houston has been accused of racial discrimination, both internally and externally. On February 27, 2018, 58-year old former Capital One Bank Community Development Banking Senior Vice President of Texas and Louisiana, Laurie Vignaud, along with the National Association for the Advancement of Colored People, Houston Branch (“NAACP”) and the League of United Latin American Citizens, District VIII (“LULAC”), have filed a major federal racial discrimination lawsuit against Capital One Bank, a publicly-traded national bank. The lawsuit was filed in the Southern District of Texas (Houston Division) against Capital One Bank for allegedly violating four federal laws, including the U.S. Constitution, because the bank decided to only close branches in Black and Hispanic communities, according to the suit. The suit also alleges Capital One has engaged in a conscious and deliberate plan to close banks in Black and Latino communities while keeping banks in White communities and has unwittingly used major Black personalities, such as Samuel L. Jackson, Spike Lee and Charles Barkley to advance its program to relegate minority bankers to only debit-card carrying customers. Another stunning aspect of the suit is that Vignaud, who had been employed with Capital One for nearly 20 years, was prematurely relieved of her job duties because she complained about Capital One Bank’s discriminatory practices. This is a startling and damning allegation, especially coming from one of Houston’s most respected businesswomen and celebrated community leaders. It is difficult to question the integrity and exemplary work history related to community engagement that Vignaud has displayed, especially considering the fact that she received Capital One’s Circle of Excellence Award three times. 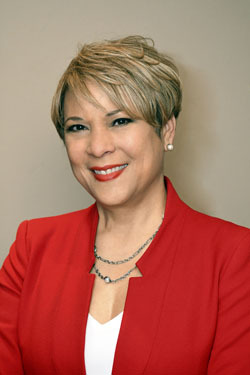 In addition to her work with Capital One, Vignaud also served on the board of the NAACP Texas State Corporate Advisory Board, City of Houston Office of Business Opportunity Advisory Board, Texas Southern University Business School Advisory Board, Houston Area Urban League and the board of the Ensemble Theater. This past April 11, 2017, the Forward Times was on hand as Mayor Sylvester Turner and the members of Houston City Council honored Laurie Vignaud with a proclamation and marked the day as “Laurie Vignaud Day” in the City of Houston, having been nominated for the honor in recognition of her long-standing contribution of service in the areas of community development, small business development, economic development and financial literacy. In her role with Capital One Bank, Vignaud had the primary responsibility for the development, monitoring, management and promotion of community development programs and Community Reinvestment Act (CRA) initiatives for Capital One Bank in Texas and Louisiana. She created and led some of the bank’s most innovative affordable housing, small business and asset/capacity building initiatives in the region. One such program, “Getting Down to Business”, has received national recognition from Capital One Bank and other respectable entities. It is with that track record of community engagement, as well as her more than 20 years of experience in community development and more than 24 years in banking, specifically as it relates to her overseeing the CRA initiatives for Capital One Bank, that this lawsuit is a major development and one that is being looked at very closely by many in the Houston community. The suit also alleges that Vignaud was actively involved in the monitoring of Black and brown activists on behalf of the bank and also alleges that she repeatedly complained to Capital One Bank to inform them they were breaking the law by discriminating against minority communities. Since the 1960s, the practice of “redlining,” has been a detrimental and discriminatory practice all across the United States. The practice would consist of mostly all-White bankers sitting around a mahogany table with a red pen and literally outlining which areas of town they wanted to loan money to and solicit customers from. In addition to cherry picking the predominately White neighborhoods for their business model, the banks would in turn choose the areas of town where they refused to lend and provide their services, which would mostly be in Black and brown neighborhoods. The federal government got involved with the issue of “redlining” starting in the 1970s for three reasons. First, groups like the NAACP and LULAC started filing lawsuits challenging the behavior; second, banking services were recognized as a basic service that no one could do without; and third, the federal government had some leverage because it provided every bank in the country with deposit insurance, and still does. Although it might not be a sign people readily remember seeing, every bank has a sign that clearly states that consumer deposits are protected by the federal government’s Federal Deposit Insurance Corporation, also referred to as the FDIC. Deposit insurance was established so that all consumers could always have confidence in their bank accounts. Although the federal government got actively involved with the issue of “redlining,” it is not just a thing of the past. It continues today. As many as nine recent, high-profile cases are proof that the discriminatory practice of “redlining” is not a thing of the past. On September 10, 2015, New York Attorney General Eric Schneiderman settled with Evans Bank for $825,000 after discovering a “redlining” practice of erasing Black neighborhoods from the maps they used for determining mortgage lending, having taken only four mortgage applications from Blacks out of the over 1,100 mortgage applications they received between 2009 and 2012. In May of the same year, the U.S. Department of Housing and Urban Development announced a $200 million settlement with Associated Bank over redlining in Chicago and Milwaukee, whereby the complaint said the bank denied mortgage loans to Black and Latino applicants between 2008 and 2010. And right here in Texas, a recent review of millions of federal records by Reveal from The Center for Investigative Reporting found that “redlining” is alive and well, in that Blacks and Latinos in five Texas metro areas, including San Antonio, were found to be more likely denied a conventional mortgage loan versus Whites. There are many other recent examples, but the primary point is that “redlining” still exists and its practice is historically harmful to communities of color. And, while the Community Reinvestment Act requires all banks that receive the benefit of deposit insurance to be regularly evaluated for compliance, according to the OCC, Capital One Bank, which is headquartered in Virginia, has not received a CRA rating since 2013. (See www.OCC.Gov). Since these federal laws were established and amended, many banks have been sued for discrimination, but here in Houston, this is the first case that outlines just how much the African American community would lose as a result of these alleged actions. People who already have a Capital One branch in their neighborhood would lose access to that branch and all of the services that go along with it, such as check cashing, ATMs, mortgage loans, auto loans, certain checking accounts services and customer service in general. Although banks would argue that all consumers can easily access their services through technology, that is a typical way of avoiding the simple truth, which is that most banks prefer to be in predominantly White communities, because in their minds, White consumers tend to have more wealth which will lead to their branches making more money for the overall bank. And here is another important fact. According to the American Bankers Association, a trade group located in Washington, D.C., the average bank branch costs at least $675,000, so it is safe to say that once these branches are gone, along with its basic services, it won’t come back. Another key loss in the African American community is the departure of Laurie Vignaud, who has been a voice and advocate for fairness and equality across the markets she covers. Given that there are so few people of color working in corporate America, this decision may prove to have even more serious consequences for Houston. It’s also noticeable that other esteemed African American executives who once represented major corporations like AT&T and Wells Fargo in Houston are also no longer with their respective companies. Is there more to come? Only time will tell and the Forward Times will continue to follow this case to see if it is an isolated incident or an even larger issue that has just been exposed as a result of this explosive discrimination lawsuit. Stay tuned!